Are you ready for some Football??? A Super Bowl Party??? I know I am. And this recipe would be the perfect star attraction. Sweet, Tangy and Down Right Tasty. The beauty of this dish is the sauce keeps getting better and better with time. So go ahead and get those napkins ready. It’s time for some #SaucyGoodness. For the meatballs: Preheat oven to 375 degrees. Mix all ingredients together. Shape into balls (bite size). Place on cookie sheet (ungreased) and bake for 20 minutes. For the sauce: Mix all ingredients together in a saucepan. Bring mixture to boil, stirring continuously. Once boiling, simmer on low for 20 minutes, stirring occasionally; if mixture becomes too thick just add water. 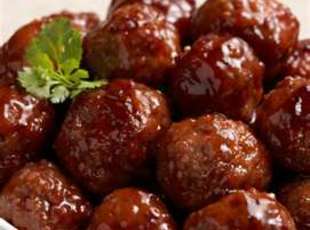 Once the meatballs are fully cooked place them in a crock pot and pour the sauce over them. Place a cup of toothpicks next to the crock pot and you are ready to entertain. Posted on January 24, 2013, in Lady Fab Cooks and tagged Cocktail Meatballs, dinner, food, lunch, party food, recipe, snack, the porter house grille. Bookmark the permalink. 1 Comment.